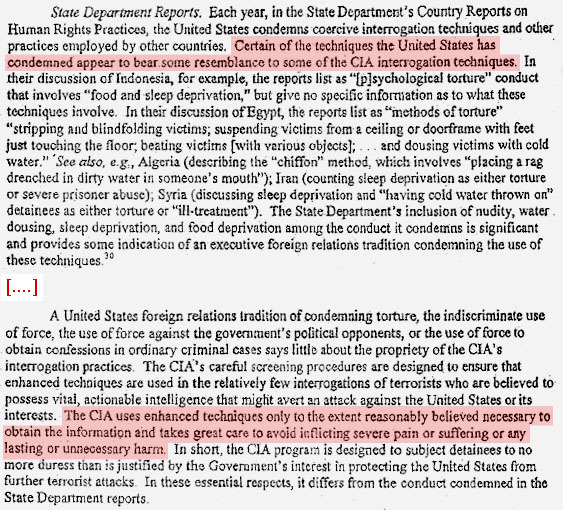 Reading the OLC torture memos is enough to make you ill. The techniques in question are plainly and instinctively abhorrent by any common sense definition, and the authors of the memos obviously know it. But somehow they have to conclude otherwise, so they write page after mind-numbing page of sterile legal language designed to justify authorizing it anyway. It’s not torture if the victim survives it intact. It’s not against the law if it takes place outside the United States. Waterboarding is OK as long as it isn’t performed more than twice in a 24-hour period. Sleep deprivation of shackled prisoners for seven days at a time is permissible as long as the victim’s diaper is changed frequently. And on and on and on. Do they know this is torture? Of course they do. Glenn Greenwald is right when he says the excerpt below is probably all you need to read. What it says, in a nutshell, is that when other people do this stuff, we naturally call it torture. But when we do it, it’s not. Sickening. UPDATE: More here from David Corn.